Complete Hardware Kit for Hard Dog Roll Bars. New roll bars include the hardware. If you are reinstalling a used roll bar or had to remove your roll bar for any reason, we strongly recommend replacing the hardware. 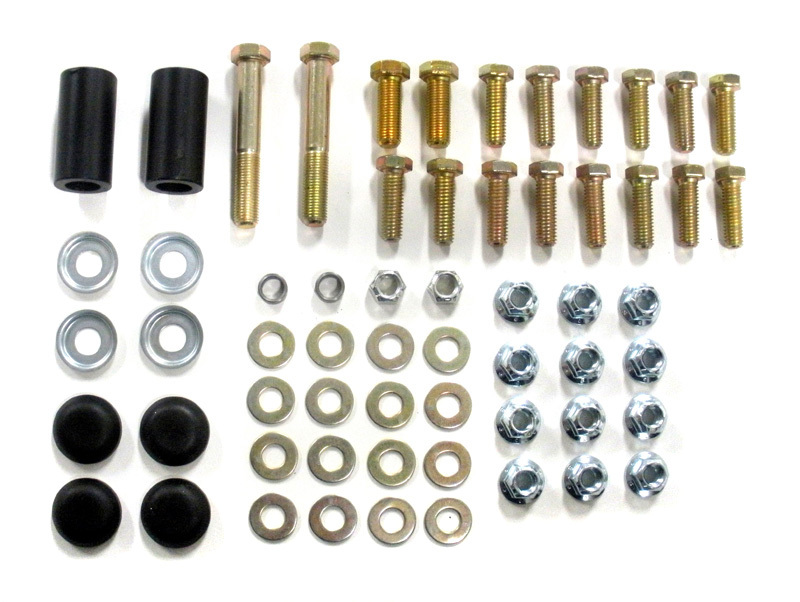 This is all the hardware needed to install a Hard Dog roll bar. Since roll bar's are safety devices, it is better to be safe than sorry. Includes all hardware needed to install the Hard Dog roll bar. Replacement backing plates available seperately if you are missing them however they are reusable. 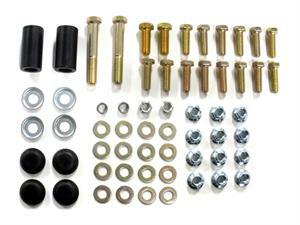 Most roll bar hardware is $40 with the following exceptions. M3 Hard Bar is $20. Flat rate shipping is $10 or $20 when ordered with packing plates. When contacting us, please provide the following information so we can best assist you. NOTE: If you do not know which bar you have, please email photos from several different angles and provide the tubing diameter (It's either 1.5" or 1.75") and we can help identify the bar. WARNING: This article is sold without warranty, expressed or implied. No warranty is made to this product's ability to protect the user from any injury or death. The user assumes that risk. Do not use harness bar without a roll bar installed. NOTE: This item has flat rate shipping. All Hard Dog products must be ordered individually for our website to calculate shipping. Leather and vinyl stitched covers with Custom Formed High Density Padding for Hard Dog Roll Bars. UltraShield's new Cam Lock harness systems are the highest quality made in the U.S.A. Cam Lock quarter turn buckles. All Cam Locks come standard with a quick release adjuster on lap and shoulder belts. Front and rear tow hooks for 90-05 Miata. Mazda's factory two hooks are for tying the car down to a shipping deck only. These brackets will clear the bumper to prevent damage from towing. Designed for quick installation and removal of safety harness systems with the Floor Mount Kit Hardware. Combine these forged eyebolts with our harness clips for quick harness installation and removal. Track Dog Racing Custom Seat Mount for Ultra Shield TDR Rally Sport Race Seats and other flat bottom mount race seats. They are made of high strength steel and laser cut and formed to an exact fit. The Bolt-In Harness Bar is designed for competition harness wrap-around shoulder strap attachment and ties into select Hard Dog roll bars. Requires no drilling or panel alteration.